Spot resin trading started slowly and gathered steam as the week wore on; Friday was a holiday, so it was Good, right? Completed volumes were solid, but not stellar, and as typical, transactions were heavily weighted in favor of Polyethylene over Polypropylene. The bottom end of pricing firmed further, but overall levels for both commodity resin groups remained flat across the board. The flow of fresh railcar offers was fairly steady, with added liquidity provided by traders making their uncommitted warehoused inventories available for immediate shipment. Producers have their $.03/lb PE contract increase on the table for April; however, the market will likely remain steady again. PP contracts could see a small cost-push increase come through. Resin exports continue to shine; there is good PE demand from all regions, while high quality PP exports are generally shipping to Latin American countries. With regard to activity, the major energy markets flipped a bit this week - Crude Oil was nearly unchanged while Nat Gas prices tumbled. WTI Crude Oil rolled to June and experienced a low volatility inside week, gaining a scant nickel to $64.07/bbl. Brent Oil was a little bit stronger, adding $.42/bbl to $71.97/bbl. Nat Gas had previously been range bound, but broke out to the downside, chunking off $.17/mmBtu, more than 6%, to settle at $2.49/mmBtu and below a psychological support level. NGLs continued their back and forth results, this time giving back last week’s gains. Ethane lost $.01/gal to $.23/gal ($.097/lb). Propane shed a sizable $.043/gal to $.63/gal ($.179/lb). The monomer markets saw pockets of active trade when relatively large volumes changed hands. Ethylene prices were picked away every day, as participants pummeled the monomer to the downside. The week’s highest volume came on Monday when traders seemingly rolled some April positions forward into May. Additional late week action was noted, with trade taking place in the forward curve as prices continued to crumble. April Ethylene found its $.13/lb low on Thursday, though only down $.0125/lb, given the low price level, it equated to a large 9% loss. PGP was also poked around by traders testing the market with scattered bids and offers, but overall action was uninspired. Prompt prices were flat to firm, with April PGP at $.335 - $.34/lb, while May remained at $.35/lb. 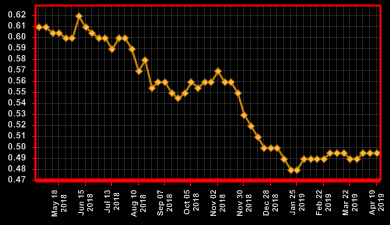 The forward curve saw prices retreat and the contango shape flatten a little, Dec 2019 is now just $.39/lb and peaks next June a tick below $.415/lb. Current pricing still supports a slight increase for upcoming April PGP contract settlements. The spot Polyethylene market stepped up its pace, completed volumes were healthy despite Friday mostly observed as a holiday – most saw it as Good while others just Passed Over. Our trading desk completed an above average number of transactions as buyers came to the market to buy for not only prompt delivery but also ahead. Activity was spread pretty evenly among grades and no material particularly stuck out. Although our spot prices were flat this week, market sentiment remains slightly bullish in the short term as availability has tightened up a tad. Overall pricing has generally been very stable over the past few months with spot volatility restricted to a few cents. April contract prices have yet to settle, but will likely roll flat again. Assisted by higher crude oil prices, export opportunities continue to pelt the US market as resin is flowing strongly to all regions. Polypropylene trading was lackluster this past week. Demand was off and fresh offerings also fell short of their usual pace. Buying activity was mostly seen from processors seeking to fill in their immediate needs with some reportedly adding to on-hand inventories. After recovering a penny or two from the cycle low, spot PP levels held steady for the second week in a row. 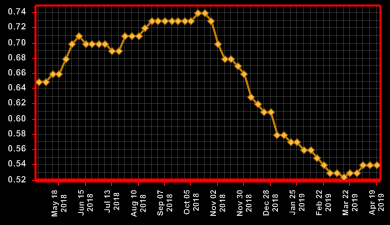 Spot PGP monomer prices still support a modest price increase, while the forward market indicates an upward trend has already begun and could accelerate as time ticks. We have added to our inventory positions and maintain a friendly sentiment towards the market as we believe the Polypropylene supply / demand dynamic is tight enough that any further production issues could trigger rising resin prices, especially considering the bullish monomer curve.